I’m playing finished-object catchup this week with two sample knits for Plymouth Yarns: a bag, and a necklace. 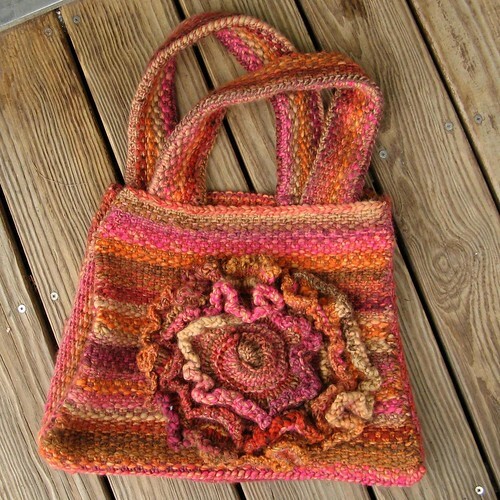 The body, gusset, and handles of this bag are all in linen stitch. This helps even out the extreme fat-and-thin nature of Bazinga. The giant flower was … interesting. I had a devil of a time getting it to lay down and behave, then sew it in place. The handles are doubled and whip-stitched together, as are the seams between the body panels and the gussets. This piece was uncooperative, but eventually I nailed it down! 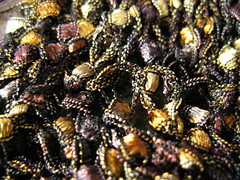 Eros II is a novelty yarn, with colored metallic squares suspended in a skinny “ladder” of black yarn. This pattern called for the yarn (and I use that word loosely!) to be held double. Lots of short rows of increasing length creating the gradually larger ruffle. I’m not sure I would wear it … but it’s a sample, so once I finish and mail it off, it’s out of my hands. love them both! 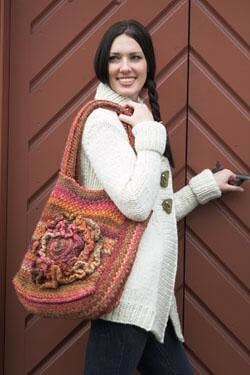 At TNNA, the bazinga tote got a lot of compliments- it was in the fashion show as well. Lots of people loved that it looked “woven” and not knit. Thanks for your expertise as always, Rachel! I like the bag more and more every day :). It got lots of covetous looks from my friends while I was making it. As for the necklace — I believe you’re right! I’m hopelessly out of date sometimes 🙂 — plus (as I tell my kids all the time) I was never “cool” to begin with. I generally don’t wear jewelry (or makeup, for that matter), so it’s no surprise I wouldn’t know what to do with jewelry made of yarn. I liked the necklace and would like to see patterns for making jewelery with yarn, beads etc.